You are here: Home / Tech News / Is Technorati and Alexa dead? Is Technorati and Alexa dead? I am looking at Alexa stats and Technorati rankings, surprisingly none of them is working correctly at the moment. Both of them stopped working or behaving weirdly, i hope it is a small glitch in the system. Alexa is usually behind 2 or 3 days in displaying stats but now from May 19th it is not updated, what is happening? 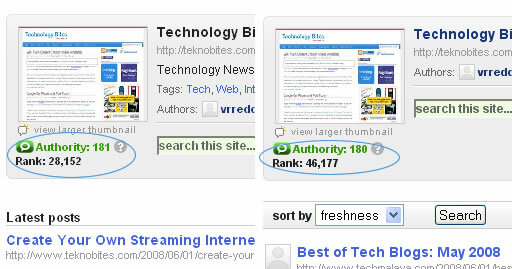 Technorati has s different problem, it looks like it is not reliable anymore for rankings. See the two screenshots taken at the same time, both of them show different rank for the same site, i noticed this few days back and thought its a temporary issue but looks like it is not. It is useless to contact Technorati they don’t respond and bother about users. I used to check Technorati once in a while when I started blogging. Not any more. IMHO, The site has lost its charm. I’m surprised also about Alexa, but Technorati has been dead for a long time. I agree with Shankar, Technorati is not any more a big site. Technorati is really freak now. I also don’t believe stats on Alexa because because Alexa shows itself 0 and no-ranking. How funny! To me they are dead. Technorati has gone crazy and is horribly unreliable, and Alexa is outright wrong. Use Quantcast instead – 100% accurate once you put the tracker on your site. The rank on Quantcast for my new site TomatoGames is 90,000 or so, on Alexa it’s 475,000+ ….. Even i haven’t checked Technorati since long time. Ever since Alexa has changed there ranking algo, they take a long time to make an update. Its all a conspiracy. Page Rank was what we told our clients as important and then all of a sudden sites its not as important. Then its Alexa and so on. Its a continuous battle teaching then un teaching our clients. It makes us look like we don’t know. I’m trying to claim my blog at the moment and it is a nightmare, no wonder they are tracking less then 5% of the blogosphere. It’s not working for me either. Deader than a door nail. Anyone have any other suggestions? Hi! Iâ€™ve found another site valuation tool and it seems to provide competitive analysis for free. I’m talking about http://www.estimix.com .The estimation provided by estimix is the result of a complex analysis based on factors like: the age of the website, the demographic structure of the traffic, the countries where the website is popular and sources of the traffic.